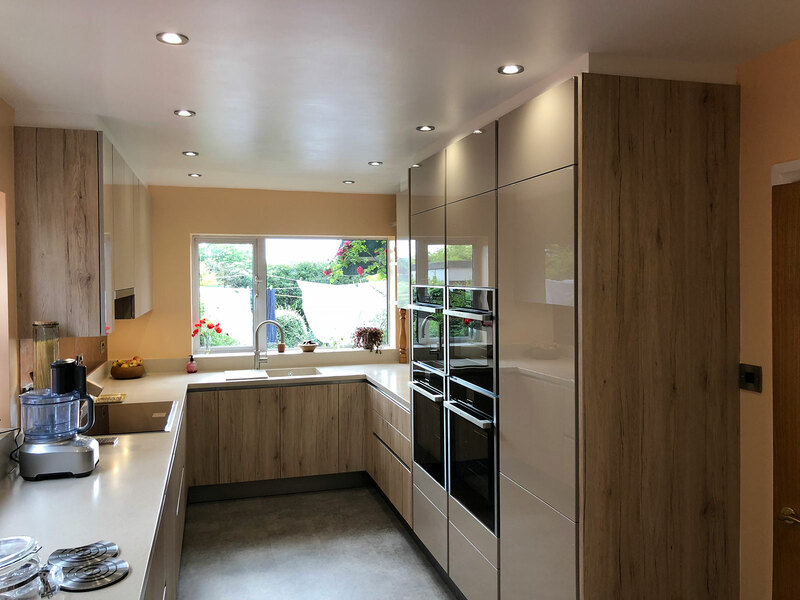 In this project our clients were experienced and enthusiastic cooks, therefore it was important that the work surfaces were practical yet expansive, something that was lacking in the old kitchen. 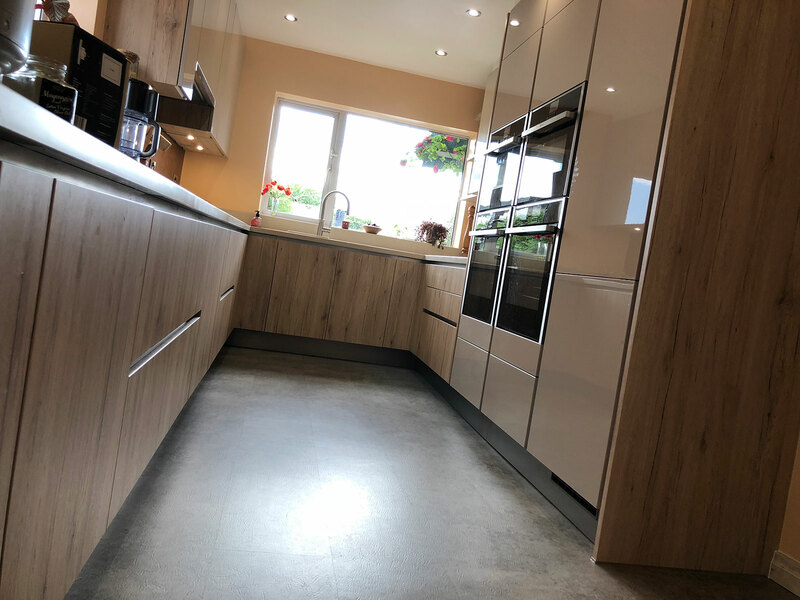 This was achieved through the incorporation of a seamless Corian worktop that blends into the sink as well as having coved upstands where the worktops meet the walls, thus removing the need for any silicone jointing. 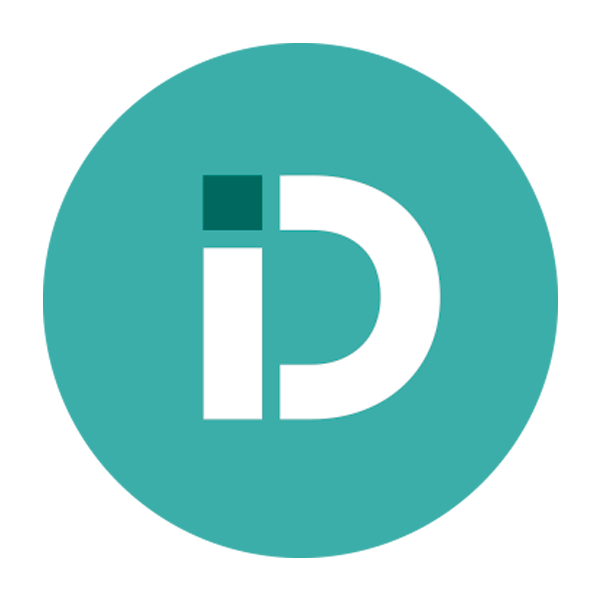 In doing so, a flowing, easy to clean surface was created, which provides a balance of functionality and elegance. High gloss finishes on the window-facing units, optimise the space’s natural light, whilst sand oak effect base units give the room a warmer feel overall. Both materials are durable and easy to clean, which fits the culinary demands of our clients. 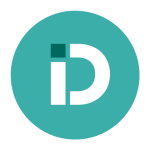 The inclusion of a Quooker boiling water tap brings multiple benefits, as it not only provides instant boiling water for cooking, but it also frees up space on the worktop that would otherwise have been occupies by a kettle. 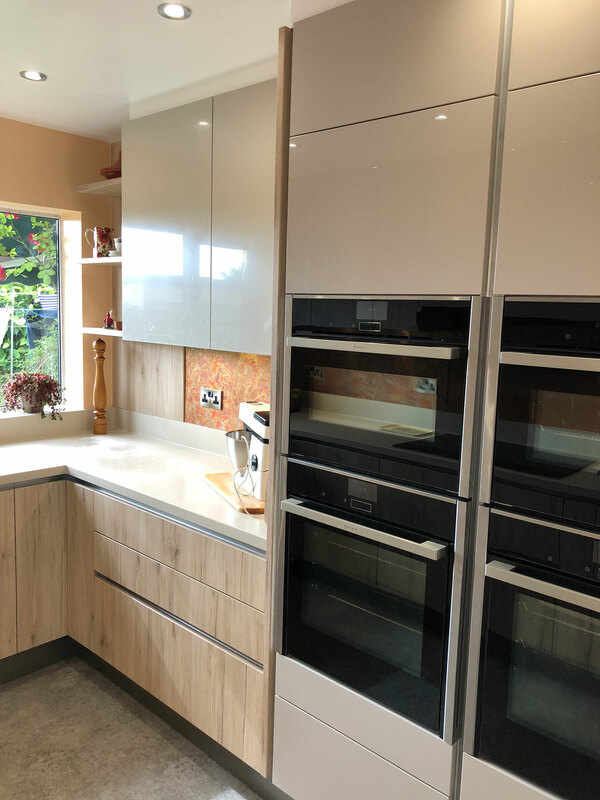 A variety of carefully chosen Neff appliances were incorporated amongst which are both full and Vario-steam ovens, which enhance the practice of numerous different cooking styles from baking to classic British to Mediterranean. 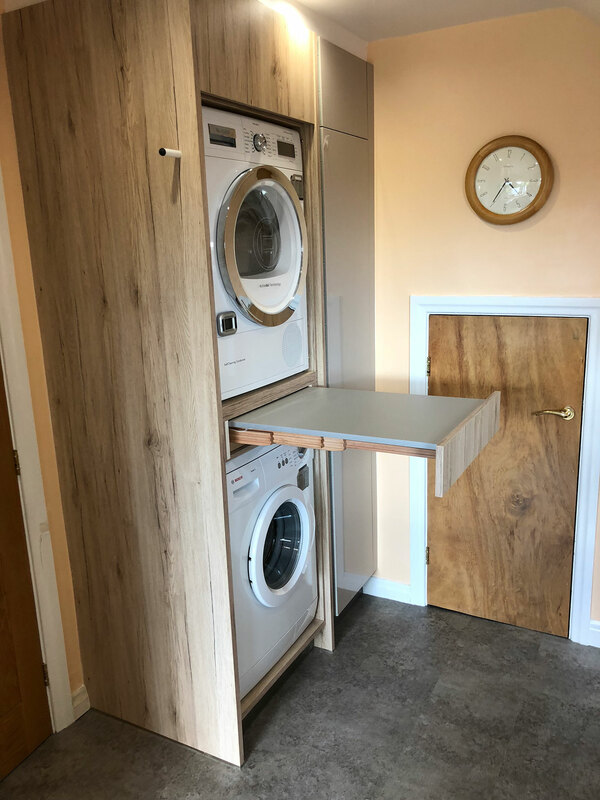 Perhaps one of the most innovative aspects of the design is the inclusion of a stacking unit for the tumble dryer and washing machine that the client wanted to be placed within the kitchen area. A pull-out table between the two utility units allows washing to be placed conveniently and comfortably as it is exchanged between the two machines. The addition of underfloor heating and warm Copper tones on the glass backsplash finish the kitchen, providing a memorable feature to complete a simple yet stylish and cosy design. 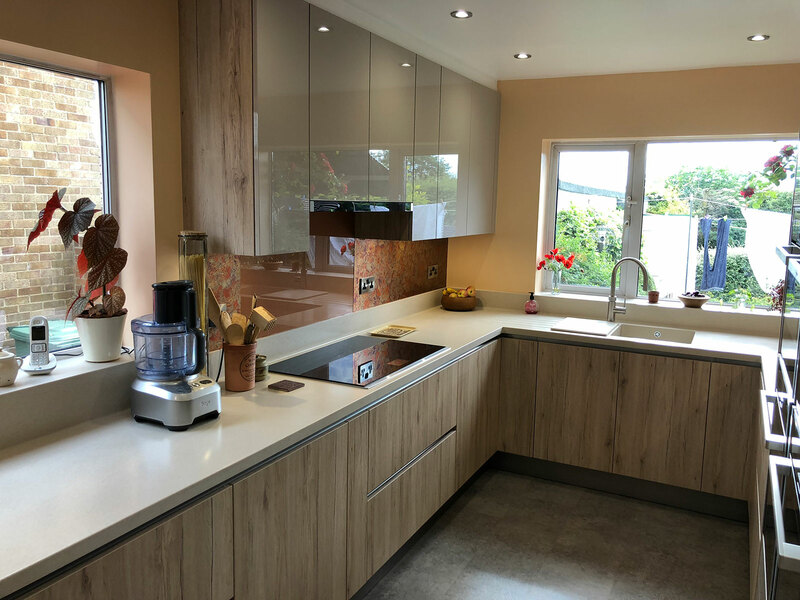 High gloss cashmere and sand oak effect handleless kitchen. 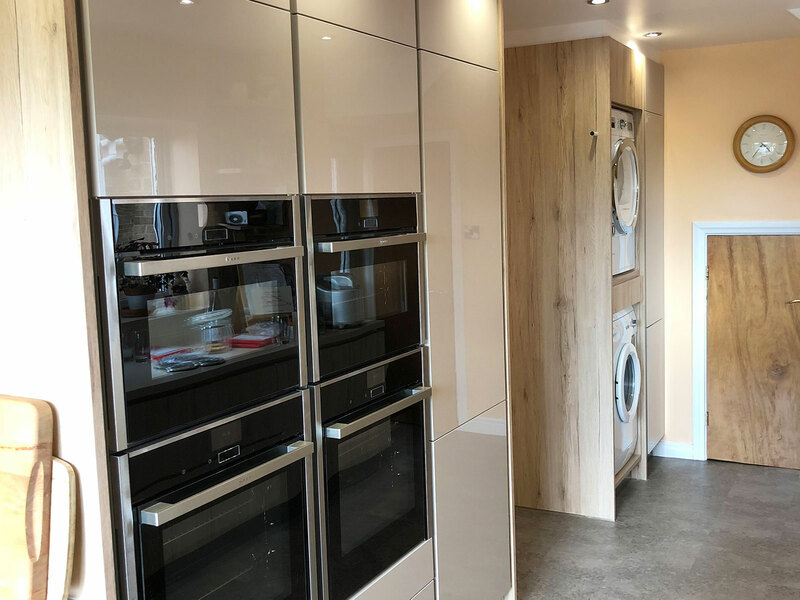 Corian worktops, coved upstands, high gloss, Quooker boiling water tap, Neff appliances, Vario-steam ovens, appliance stacking unit, pull-out table, underfloor heating.